Mobile Water Filtration: What Is It? Mobile water filtration is commonly used during emergency situations or scheduled outages where you need guaranteed water quality and quantity. When you or your employees are in need of water in large quantities, our mobile water treatment units can quickly provide you with high-quality drinking water. Our filtration process creates water virtually free of cryptosoridium, giardia, and other disease-causing bacteria so you can drink without health fears. We are your best choice for a water purification solutions provider. Mobile water treatment systems can purify water from any water source including rivers, well water, sea, brackish, and other sources of water. 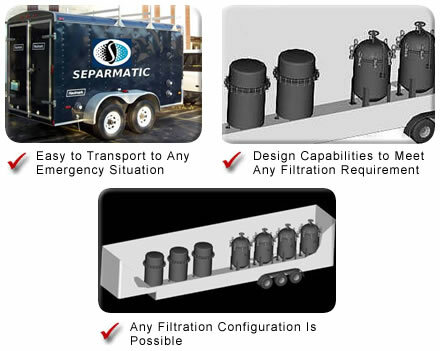 Contact Separmatic for your mobile water clarification needs today! Disasters can happen anytime. Hurricanes, floods, tornadoes, earthquakes—all of these situations can cause drinking water supplies to become unsafe. 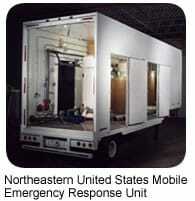 Fortunately, a Mobile Emergency Response Filtration System (MEFS) from Separmatic can reach virtually any affected area quickly and be operational in a very short period of time. Our MEFS can provide high-quality portable water of .010 NTU (Nephelometric Turbidity Units) or lower. Our potable water filtration solutions make contaminated water safe to drink! If you’re in need of mobile reverse osmosis, contact us today! Call Separmatic at 414-466-5200 with questions about our water treatment technologies and mobile drinking water treatment filtration systems, or contact us here to request a free brochure or quote today on our custom water purification products! We provide top notch mobile water systems for our clients! Copyright © 2019 Separmatic LLC- (414) 466-5200 - Website Created By: One Click Inc.